Prime Minister Narendra Modi has asked students to stay focused, manage time well and not to succumb to stress. He said that students should focus on acquiring knowledge to enrich their lives, without worrying about examination results. Mr Modi suggested that examinations should be considered as a festival to enjoy and live a happy life. He said learning cannot be reduced to examinations only but education must equip students to face various challenges of life as well. 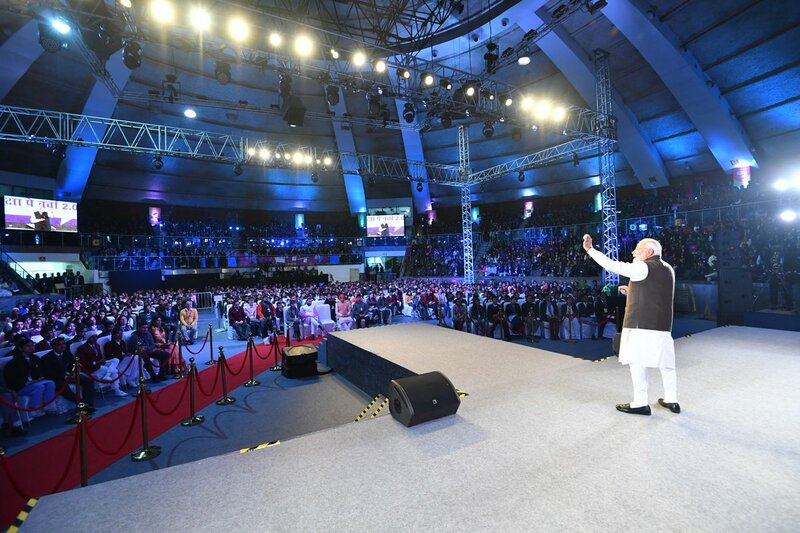 Interacting with two thousand students, parents and teachers from all over the country as well as students from abroad in the second edition of Pariksha Pe Charcha, Mr Modi advised students not to lose hope after failing their exams. He said life is about dealing with challenges resolutely. He also advised students to listen to their parents’ counsel with full attention to avoid confrontation. Mr Modi cautioned parents against imposing their will on their children, but encourage them in their own pursuits. He requested the parents not to fulfil their unfulfilled dreams through their children. He said every child has his or her own potential and strengths, adding that it is important to understand this. Mr Modi said parents should not treat report cards of their children as visiting cards to impress the society. The Prime Minister said children should convince their parents in choosing their own path based on inherent talent and field of interest. He said clarity of thought and conviction need to be developed. The Prime Minister made a clarion call for developing interest in Mathematics and Science as very few people choose these subjects for study. Replying to a student’s question, the Prime Minister urged students not to succumb to pressure as exam-related stress makes matters worse. On a query by a mother from Assam about mobile phone addiction among children, Mr Modi suggested that technology must be leveraged to enhance one’s capabilities. He stated that technology should lead to expansion of the mind and act as means to innovate. Mr Modi stressed on dedication and focus to attain lofty goals. Touching upon the subject of depression, the Prime Minister said it is very worrying. He, however, stressed that the more people talk openly about aspects relating to depression and mental health, it is better. He said counselling is not a bad thing as talking about one’s problems is good to alleviate sufferings. Speaking at the programme, Human Resource and Development Minister Prakash Javadekar said the participants from abroad include students from countries, including Iran, Nepal, Doha, Kuwait, Saudi Arabia, and Singapore. The programme is being telecast in all Government and CBSE Schools, higher education institutions and colleges in the country and abroad.